Emory has built business affiliations and community engagements that span both DeKalb County and the City of Atlanta. Emory University filed a petition on Tuesday, June 27, to annex into the City of Atlanta. The university, including its health care facilities on the Druid Hills campus, will remain in DeKalb County, and upon approval of the petition, will also be part of the City of Atlanta. Emory has built affiliations and community engagements that span DeKalb County and the City of Atlanta. For example, Emory’s operations include several hospitals and clinics in DeKalb County and one in the City of Atlanta — Emory University Hospital Midtown. In addition to Emory’s longstanding civic and community engagement in DeKalb County, the university’s strong partnerships with Georgia Institute of Technology, Georgia State University, the Morehouse School of Medicine and Grady Memorial Hospital, as well as its investment in arts, culture and scholarship in Atlanta, continue to grow. 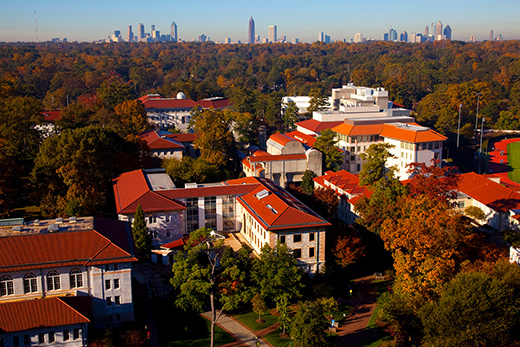 According to Emory President Claire E. Sterk, annexation into Atlanta will complement the university’s commitment to local, and thereby global, engagement, while continuing to contribute to both jurisdictions. “We are enriched by our relationships with the county and the city as well as the larger region and the state and look forward to building upon our commitment to community involvement, academic excellence, innovation and entrepreneurship,” says Sterk. Next steps in the process include the city’s regular public meeting process for annexations. It is expected that the annexation will be effective in the fall of this year.